Google to see if the author has a website or others have written reviews or features about that writer. Online or in the library check easy details like which books, dates and bio details. Often publishers have these on their websites. Inspire Where Are They Now? 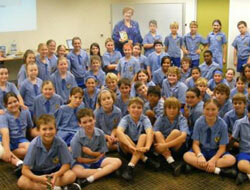 What Hazel was like at school .As an ex - state school student at Ashburton Primary and 4 High Schools. Channel 31 Kids in the Kitchen Linking Cooking and Reading ideas for your own TV program. These FAQs are a selection of those recently asked of author Hazel Edwards either in web chats, interviews, fan mail or in person while she visited schools and libraries. Observation. I keep an ideas notebook. I eavesdrop and stickybeak, both of which are called research if you are a writer. I ask 'what if?' Increasingly I am inspired by settings like Antarctica or the Northern Territory in 'Outback Ferals'. A story needs a character with a dilemma, a place and a problem. Motives interest me first. Often it's the conflict of an individual who thinks differently which starts a story. Could be an animal character too! Do you ever put people you know in stories? Characters in fiction are composites, but they might be inspired by an incident or an unusual dilemma. Occasionally I've written a private story for a real child such as 'Where Did My Birthday leap to?" for Liam who was born on Leap Day or 'The Lachieberg' about the iceberg for Lachie. I write a story for my grandson each birthday. Sometimes these stories are later published because they appeal to others in similar situations. I work in my home study on a computer. I use a 'message stick' to carry files, and occasionally a digital camera for background shots. I can 'web-chat' with literary conferences or I use Skype with my interstate co-authors. When did you first appear in print? What was the first book you wrote? A story in the newspaper's kids' section when I was about eight. 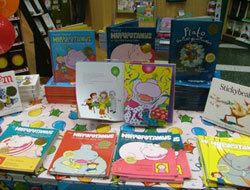 The first hippo picture book was my third published book, 28 years ago. My first novel was 'General Store' which was then published in Finnish, which was my first translation. Very exciting to see your words in another language on the bookcover. Do your children help with stories? My children are adult now but recently I co-wrote 'Cycling Solo; Ireland to Istanbul' with my son Trevelyan. They used to give my stories the 'yawn test' by placing face down the page where they lost interest. Then I'd re-write. How do you choose names for characters? Either the names are symbolic, like Crystal or popular with the age group, like Jack. Popular Kyle from 'Outback Ferals' is short and I needed to be able to call him Big K so he needed a K name. There's thinking time and writing time. And re-writing time. I'm a fulltime author so a novel such as 'Outback Ferals' would take me about six months to write 30,000 words, but only after about a year of researching and plotting. I do about five-ten drafts. In between I'd be working on the five book lengths projects I average a year. Often it takes a year for the book to be published from the time I've finished the last manuscript version. Picture books take the longest to rewrite. Every word counts. Others love the cake-eating hippo from 'There's a Hippopotamus on Our Roof Eating Cake'. My current w.i.p. (work in progress) favourite is Platypus 13, the part-time plumber who has a tool kit for fixing pipes and people's problems. He carries smile spray. How many drafts do you do? If you get stuck on a story what do you do? I always have several projects running and change from fiction to non fiction, do some administrivia like answering letters, go for a swim or try to interview my character. Or I may 'talk' possible endings onto tape. Can you offer any advice to aspiring illustrators? I write an art brief which is like a letter to the artist. Think about why the reader/viewer will be looking at this page. To be entertained? To be provoked into thinking differently? To view their world differently? To learn something? Then use visual clues like colour, shape and design to make that happen. As a student, how can I get my work published? Try your school magazine or Ozkidz magazine. Offer to review books for radio stations like Radio RPH Children's Hour. Enter all competitions. Consider writing scripts and performing your work too. If you were to host a dinner party for three of your characters, which ones would you invite and why? The Big Hippo because he's been my friend for 28 years, the new Hand Me Down Hippo because she's a new female friend and maybe my expeditioner Kyle from 'Outback Ferals' and 'Antarctica's Frozen Chosen' because I've enjoyed being a bloke in those novels. How would you describe yourself in 3 ways? Quirky thinker. Observer of people's motives. Impatient but persistent. Belly dancing for exercise in between long stints at the computer. It loosens my muscles and my imagination. Using the 'cappuccino approach' of working in a café with my co-author for a change of scene. Writing on location, as participant observer e.g. when stuck in the polar ice of Antarctica during an expedition or in the Northern Territory for 'Outback Ferals'. Have you ever had the original title for one of your books changed prior to publication? Nearly always. One hippo book 'Hey Hippopotamus do Babies Eat Cake?' had 39 temporary titles. By mistake 'Antarctica's Frozen Chosen' was almost called 'Frozen Chosen' which sounds like an icy pole. 'Antarctic Dad' was originally 'My Dad's Gone to Antarctica'. As an author do you have a most memorable moment? Several. Retrieving 'Hippo' from the airport carousel, trying to clean him in my shower after being over-loved by children at festivals (and re-stuffing polystyrene filling) and being televised (from behind) by Channel 7, walking in hippo PJs in the Federation Parade beside the float of the top ten favourite books of the century. Breaking through the ice-edge into Antarctica proper. Stunning beautiful, like meringue. Being asked to autograph a book which wasn't mine. It was a Bible. The one not yet written. An author of children's books. A Spy or espionage agent. Hazel, your first published book was 'General Store', in 1977. Had you written much before that? 'General Store' (Hodder) which was also translated into Finnish as 'Kauppiaan Josie', was my first Young Adult novel-length book at 30,000 words. Before that I'd published humorous short stories for adults and children and satirical newspaper features. Short satire appealed to me mainly because I was short of time and had a quirky view of everyday events. This child-like, off-beat viewpoint has been an asset in writing for children and has prevented me from being bored as an adult. What if? is always a good anti-boredom technique when faced with routine circumstances or predictable people. Luckily an imagination is portable and not taxable. I would like more of my stories to be adapted and performed on stage, television or film. I'm also interested in animation for pre-schoolers. Interviewing people from worlds very different to mine as the basis of non fiction also appeals. Read. Write. Read. Keep trying. Recycle ideas into other formats.